A roof cannot withstand exposure to the elements of our climate with just a layer of shingles. To prevent the penetration of moisture into the sheathing and roof structure, a form of underlayment must be used. Roofing felt is the most commonly used form of roofing underlayment. We supply organic roof felt which is asphalt saturated. The felt comes in 36" wide rolls and its thickness is gauged in pounds per 100 square feet. 15lb felt will cover approximately 400 sq. ft. while a roll of 30lb felt will cover 200 sq. ft. Felt may be adjoined to the roof via staples, nails or fasteners. Felt cannot be left exposed on the roof for an extended period of time due to its fragility. Unfortunately, felt is also known to tear easily and is not particularly wind or sun resistant. Felt is used primarily under cedar shakes as well as laminated asphalt shingles, although it is slowly being taken over by synthetic underlay in popularity. Built upon 20 years of industry experience, FT Syn underlayment is poised to revolutionize the construction industry. Using the latest in anti-skid protection, the Gripspot equiped FT Syn underlayments provide superior traction for maximum safety whether being installed by seasoned roofing professionals or do-it-yourself homeowners. Gripspot technology is unique in two principal aspects, it creates an uneven plane that allows for greater traction and it allows water run-off to flow through the lower channels, ensuring that contact points are as dry as possible. For installers, this provides unparalleled safety, decreasing the likelihood of falls and injury. For homeowners, FT Syn Gripspot technology ensures that your roof-installation is a stress-free and speedy process. FT Syn prioritizes the need for sustainable development in every aspect of the construction industry. In keeping with this goal, FT Syn Synthetics are 100% recyclable and provide excellent UV protection for your home. At FT Syn we work hard to ensure that all of our products are environmentally friendly. "No. 15 Felt" is traditionally used on the interiors of roof decks and has been a staple of the roofing industry for decades. FT Syn Silver can be used in the same capacity as No. 15 Felt but offers a plethora of advantages over this outdated underlayment. As a woven synthetic, FT Syn Silver offers superior tear and puncture resistance to felt underlayment whilst ensuring increased water protection in the event that your roof begins to leak. 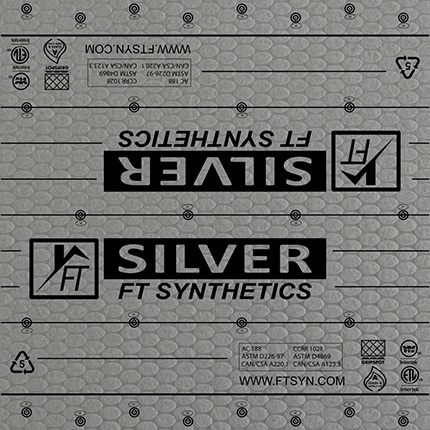 FT Syn Silver has been developed to provide approximately 2.5x the coverage-per-roll when compared to felt underlayment, whilst also decreasing the weight-per-roll by approximately 40%. For installers, this ensures that you are not required to carry multiple rolls of felt underlayment on to your roof deck and equally, with a low weight of only 27 lbs. per roll, almost anyone can carry and install FT Syn Silver. Our priority in producing FT Syn Silver was to make sure that every roof can take advantage of the benefits afforded by synthetic underlayments. FT Syn Silver is a cost-effective product that retains all of the great qualities of FT Syn's Gripspot technology, as well as a 15 year limited warranty. Coverage Per Roll (Silver has 2.5X more coverage/roll) 10 Sq. 4 Sq. The "No 30 Felt Plain" is used on the eaves and edges of the roof deck, often paired alongside a No. 15 Felt. FT Syn Gold offers a number of significant improvements over the usage of No. 30 felt, without requiring the purchase of No. 15 felt for the interior portions of the roof deck. FT Syn Gold can be installed on every inch of your roof without the increased cost and waste produced by purchasing multiple types of underlayment. FT Syn comes with enhanced Gripspot technology which provides superior traction and water run-off without the risk of leaks that is inherent with felt underlayment. At nearly 5x the coverage-per-roll than No. 30 felt, FT Syn Gold ensures that underlayment installation is not as labourious as would be the case when using felt. Installers and homeowners of FT Syn Gold will be happy to learn that our product is more than 20% lighter than asphalt felt when compared on a per-roll basis. FT Syn Gold also delivers increased UV resistance owing to the lighter color-tone, as well as a 30 year limited warranty. Coverage Per Roll (Silver has 2.5X more coverage/roll) 10 Sq. 2 Sq. In purchasing FT Syn Platinum, a homeowner is making an investment in the best underlayment the market has to offer. A premium underlayment that provides the strength of No. 30 felt with unparalleled quality and superiority in nearly every aspect, the FT Syn Platinum truly is the best. Manufactured with enhanced Gripspot technology, FT Syn Platinum has redefined the underlayment market with the introduction of the Flex Seal. Whilst retaining the increased grip and water run-off that has become synonymous with all FT Syn synthetics, the Flex Seal-enhanced Platinum offers unique self-sealing technology. This means that your underlayment not only delivers better traction for installers, but also that it better adheres to your roof deck, ensuring unmatched slip-resistance. The cool-blue colour tone of the FT Syn Platinum ensures that your roof enjoys decreased heat retention, helping provide better breathability with decreased glare. 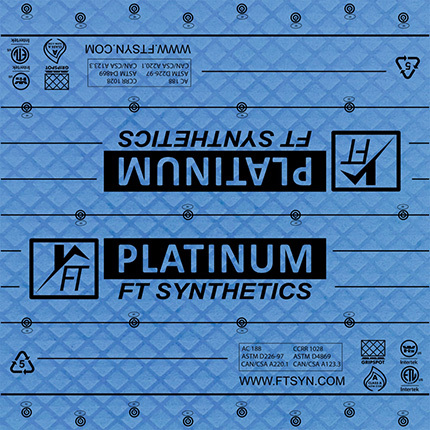 The FT Syn Platinum can be used as underlayment for asphalt shingles, metal roofs, and clay or concrete tile. If you want the best, you want FT Syn Platinum. Another form of underlayment that is used for waterproofing under shingled roofs is Ice and Water shield. Ice and Water shield is a modified bitumen roll roofing product made of glass fiber mat. It is embedded with sand in its top surface to make for a non slip surface. It comes in a peel and stick form which makes installation easy. Ice and Water shield rolls are wind resistant and protect against moisture penetration. The rolls come in a 36" width and are 65' long. Coverage is approximately 200 sq. ft.
For more information on our underlayment products, please call us 604-590-5588.